The Clare Builder Program is not a series of products, but rather a complete solution tailored towards builders and dealers looking to incorporate a smart home program. With simple installations and a low cost of entry, Clare is the ideal platform for entry to luxury homes in any market. 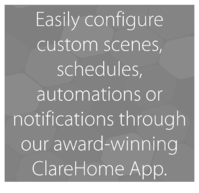 Using the ClareHome App, homeowners have complete control of all smart home devices installed from anywhere in the world. Affordable - Clare’s controller is simple to install and enables the automated lifestyle in any home, with no hidden fees. Scalable System - One solution for all homes, from starter to luxury. Homeowners can even add additional smart products after move-in. Brands People Know and Trust - Clare supports over 1,800 of the most popular devices, including: Amazon, Honeywell, Nest, Eaton, Denon, Interlogix, Lutron, DSC, Yale, Kwikset, Schlage, Sony, DirectTV, Dish, LG, Samsung, and many more! 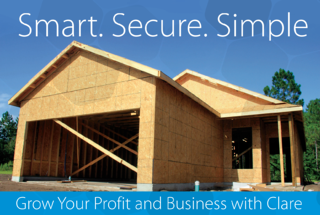 The Complete Business Solution - Clare provides our builder and dealer partners with support through the entire build life-cycle, including technical, digital marketing, and homeowner direct support. Homes that Stand Out - Safety and security features, comfort settings, energy savings, virtual presence, and more! Simple to Get Started - Our staff is knowledgeable and ready to help you get started. Contact us to discuss our basic eligibility requirements and get started today. Or contact our inside sales department with any questions!